What’s in a Name? Who are the Unitarian Universalists? 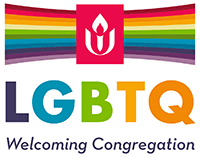 Our local church—the Unitarian Universalist Church of Hagerstown—is one of over 1,000 Unitarian Universalist churches and fellowships in the United States which belong to the Unitarian Universalist Association (UUA). The UUA was created when two religiously liberal denominations, the Unitarians and the Universalists, merged in 1961. Because the Unitarian Universalist name is so long, we usually just refer to ourselves as UU. However, we are very proud of our double heritage. Both the Unitarians and Universalists arrived in America in Colonial times, but their roots go back to the early years of Christianity. The first Unitarians voted against the doctrine of the Trinity at the Council of Nicea in 325 A.D. because they found no Scriptural evidence to support a three-natured God. Universalism developed as an alternative to the tenet that only an elect few would be saved. Universalists taught that a loving God would not eternally damn anyone. Today, Unitarian Universalism has expanded beyond its original Christian roots to draw inspiration from many other spiritual sources. Some people think Unitarian Universalists don’t believe in anything. That’s completely wrong. We UUs strongly believe in the freedom of religious expression and the capacity of all people to conduct their own search for a meaningful existence and to develop their own religious convictions. We honor everyone’s right to disagree and come to different conclusions. That’s why Unitarian Universalist churches do not require assent to any creed for membership and do not state a formal position about many religious issues. Our church’s role is to encourage individuals to develop their own personal theology by making available a wide variety of resources and perspectives. Spiritual ideas are so important to us that you’ll usually find UUs lingering after the Sunday service for discussion of that day’s sermon and other spiritual, political and social justice topics. The Unitarian Universalist Church of Hagerstown (UUCH) was formed in 1957. After meeting for years in private homes and rented spaces including the Hagerstown YMCA, members bought their first church building, a stately old home at 465 N. Potomac Street, in 1966. With the congregation growing and the old house needing major repairs, members decided to sell the building in 1997. After two more years meeting in rented space, this time at Girls Inc., in 1999 UUCH bought its present property on the Cearfoss Pike, 8-acres with a large brick house, a three-car garage, a barn, and enough open space for a future church building. To meet current needs, the congregation hired an architect and building contractor for the conversion of the garage into a meeting hall/sanctuary for worship services and large group events. Since its founding in 1957, seven ministers have served at the UU Church of Hagerstown. When UUCH does not have a minister, Sunday services feature a wide variety of guest ministers and other speakers, professional musicians, plays and other special programs. Unitarian Universalism, while small in numbers, has had a large effect through its members, which have included John Adams, Clara Barton, Susan B. Anthony, Henry Thoreau, Robert Fulgrum, Whitney Young, Jr., Beatrix Potter, Emily Dickinson, Adlai Stevenson, Ralph W. Emerson, and Thomas Jefferson. Tim Berners-Lee, the British engineer and computer scientist who invented the World Wide Web in 1989, didn’t join a UU church until after he had created the Web. However, he has written about the similarities between UU philosophy and the WWW’s free exchange of information. His essay is available at www.w3.org/People/Berners-Lee/UU.html. Buckminster Fuller was an early environmental activist, concerned about sustainability long before that idea reached the mainstream. He popularized terms such as “Spaceship Earth” and synergy, and designed practical, inexpensive transportation—including the prototype of an aerodynamic, fuel efficient car in the 1930s—and buildings, like the geodesic dome he is best remembered for. Rod Serling died in 1975 but his work lives on, especially in the reruns of The Twilight Zone, for which he wrote most of the scripts. Serling believed that the role of the writer was to “menace the public conscience” and his writing is filled with UU themes like tolerance, peace, freedom, and the worth of each individual.